You’ll be the best dressed man in every room you’re in today – from cubicle to cocktail bar. 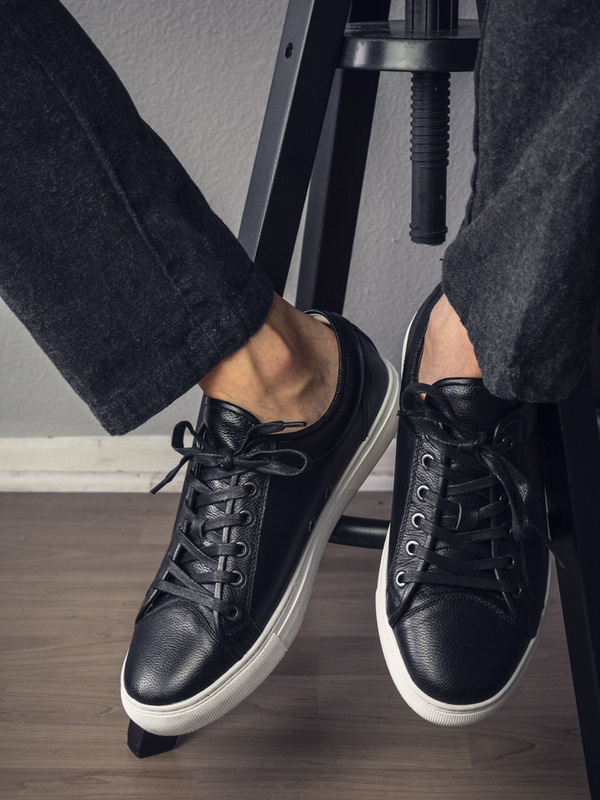 If you don't have a pair of black leather sneakers for your evenings you're missing out on a great way to keep up your level of style while including a more contemporary element. They're chameleons – they look great with practically everything. Full write up on these top grain leather options by Combatant Gentlemen coming soon. Fall Getup Week: The Modular Fall Lunch Date + 5 Variations! This is a really good get up. And J. 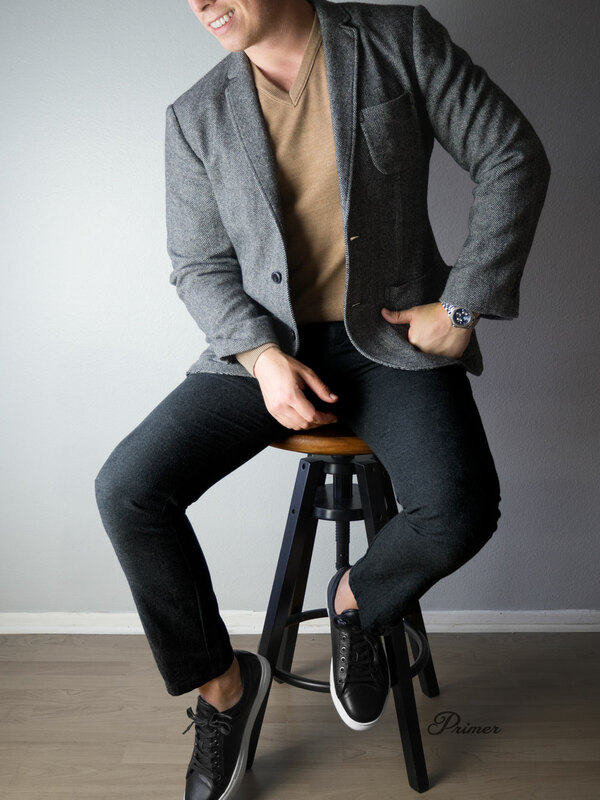 Crew factor has some decent textured wool pants for half the price that are worth looking at. What’s the quality /comfort / build of the Toecap shoes? Looking at black leather kicks for the winter and these were on the shortlist but I haven’t read any feedback about their quality yet. Any input? I really dig this outfit! Also, I’m thinking it’s definitely time to add a Denim jacket to my wardrobe. 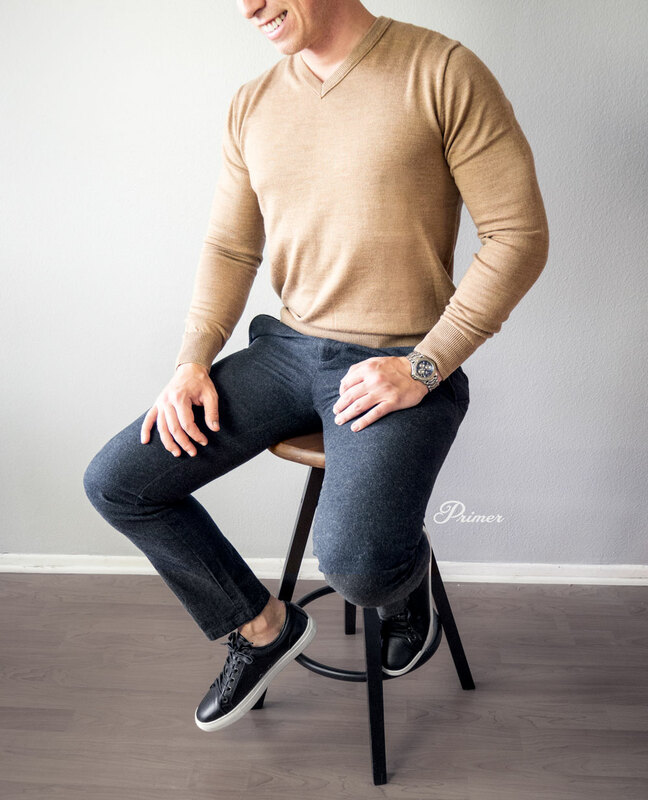 Do you recommend wearing a shirt under that sweater or nothing? Like a deep v shirt maybe? Thanks. Always wear a shirt underneath. Keep the v going so it doesn’t jump out at you, but having, especially a wool sweater and nothing under… Itch and no thanks! Plus.. Think layers. When you get in somewhere warm, you’d wanna be able to peel it off. You can, like JT says, but I don’t. Specifically here in Southern California it can be too hot, but with this Merino wool (smooth, soft) it’s not scratchy at all. I’m not wearing one in the photos above and I wore that outfit the whole day and never had a thought about it. I would love to see any pictures if you got any with the denim jacket! I wear Sauvage everyday. The ladies dig it. Are the actual pants in the post the Express pants, or are they from somewhere else? Thanks! The ones in my photo are from Old Navy last fall and aren’t available anymore unfortunately. I tried to designate that with “similar” but I apologize if that wasn’t clear. Any black canvas sneaker alternatives that aren’t Chucks? Not crazy about the nylon on the Seavees. Any alternatives to the shoes? I really love these but they don’t run in a 13. I haven’t found any others that I like as much.